According to data released by the Conflict Monitoring Center, no escalation in militant attacks observed after death of Hakeemullah Mehsud in a drone attack last month. According to monthly security report of the CMC, militant attacks have dropped considerably in Khyber Pakhtunkhwa, during past one month. 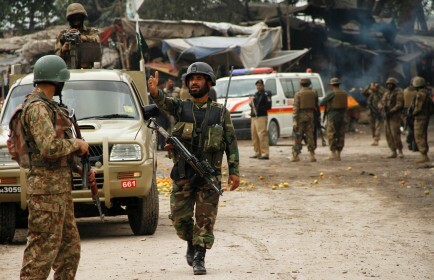 Security forces are facing continues pressure from the militants in Punjab however counter insurgency measures are so far successful in averting possible militant attacks. Situation in North Waziristan is deteriorating where security forces come under regular attack these days. 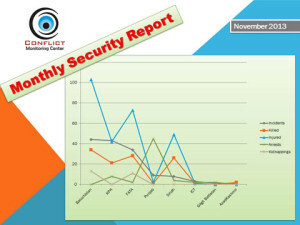 Like October, the focus of security forces remained in settled areas rather than FATA where no fatality was reported in security forces actions in November 2013.
during November,113 people including 45 civilians, 34 militants, and 34 security forces personnel lost their lives in anti-state violence and counter insurgency actions. 270 people including 189 civilians 76 security forces personnel and 5 militants were also injured during the period while 63 suspected militants were arrested and 24 people were kidnapped by the militants from different parts of the country. Total number of deaths dropped in November as compared to October where 138 people were killed in anti-state violence. Militants carried out 101 attacks during the past month in which 100 people were killed and 250 were injured. Among the killed 42 were civilians, 32 security forces personnel and 25 militants while among the injured 175 were civilians, 72 security forces personnel and five militants. Number of militant attacks slightly increased in November than October when the CMC recorded 90 militant attacks. Highest number of militant attacks and resultant deaths were reported in Balochistan where 33 people were killed in 38 incidents including 25 civilians, 5 security forces personnel, and 3 militants while 103 people including 78 civilians, 23 security forces personnel, and 2 militants were injured in the province. Militants also kidnapped 13 people from different parts of Balochistan during the month. 47 percent rise in militant attacks was observed in Balochistan in November as compared to October where 20 militant activities were recorded compared to 38 in last month. In KPK, 29 militant attacks were recorded during November 2013 resulting in deaths of 19 people including 10 security forces personnel, seven militants and two civilians. In the province, 33 people were injured including 16 civilians and 17 security forces personnel. The number of militant attacks during November dropped by 37 percent in KPK as compared to October 2013. Third highest number of attacks and second highest number of resultant deaths were recorded in FATA where 28 people were killed in 25 militant attacks including 12 security forces personnel, 12 militants and 4 civilians. In FATA, 68 people were also injured in militant attacks including 36 civilians, 29 security forces personnel, and 3 militants. Eleven people were also kidnapped by the militants in FATA. In Sindh, militants carried out five attacks in which five security forces personnel and 11 civilians were killed and one 45 civilians and 1 security forces personnel was injured. In Islamabad, two violent militant activities were reported during the month resulting death of one militant and injuring one civilian. One violent militant activity each in Gilgit-Baltistan and Azad Kashmir was reported during the month. Security forces conducted 42 actions against militants in November 2013 killing 13 people including nine militants and three civilians. One of the security personnel also lost his life during the actions. Eighteen people were injured in security forces actions including 14 civilians and 4 security forces personnel. Highest number of security forces actions were reported in KPK where 14 actions were recorded in which two civilians were killed and nine were injured while 8 militants were arrested. Two of the killed civilians died under security forces’ custody. They were released and rearrested. In KPK, security forces foiled seven attempts to cause deaths and destruction and diffused planted bombs. In FATA, security forces conducted nine actions against the militants but no fatality was reported in these actions. Five civilians were injured in security forces actions in FATA during November 2013 while two suspected militant were also arrested. Highest number of arrests by security forces took place in Punjab province where 45 suspected militants were arrested in 8 security forces actions. No casualty was recorded in Punjab during the last month. Another civilian was killed by security forces personnel in Balochistan where six security forces actions were reported. Highest number of deaths in security forces actions took place in Sindh where nine suspected militants and one security forces personnel was killed and four security forces personnel were injured. Two people were each arrested from federal capital Islamabad and Gilgit-Baltistan. Out of 101 militant attacks during the month of November, 41 were IEDs (Improvised Explosive Devices or Homemade bombs) constituting 40 percent of the total militant attacks. Physical militant assaults constitute second largest type of militant attacks. Twenty-five such assaults were reported in different parts of the county. Militants also carried out four suicide attacks, two in FATA, and one each in KPK and Azad Kashmir. Suicide bombing in Azad Kashmir was first militant activity reported in the area in 2013. It was a failed suicide attack where a group of militants engaged in clash with locals. Two of them detonated themselves while one was captured by the locals and two fled away. The insurgents also used rocket attacks, grenade attacks, kidnapping and targeted killing to perpetrate violence in the country. In Balochistan, 18 out of 32 districts witnessed anti-state violence and counter insurgency operations. Quetta was most affected districts followed by Khuzdar and Kech. Other affected districts are Dera Bugti, Gwadar, Naserabad, Chaman, Kharan, Awaran, Changi, Jaffarabad, Jhal Magsi, Sibi, Kachi, Noshki, Kohlu, Mastung and Pashin. In October 2013, the violence was reported from 11 districts of the province. In KPK, 8 out of 25 districts saw anti state and related violence with Peshawar being most affected district of the entire country where fifty percent of the total violent incidents in KPK were recorded during November 2013. Other affected districts are Swabi, Charsada, Bannu,DI Khan, Mardan, Laki Marwat and Lower Dir. In October, nine districts of the province were affected by anit-state violence. Six out of seven agencies of FATA witnessed anti-state violence during the month. North Waziristan Agency was most affected agency followed by Khyber Agency while violence was also reported from Kurram Agency, Bajur Agency, Mohmand Agency, and South Waziristan Agency. In Punjab, security forces remained active in at least four districts of the province including Lahore, Gujrat, Pak Patten, and Faisalabad. In Sindh province, Karachi and Hyderabad witnessed anti state violence during the month. During first eleven months of the current year 3507 people including 1467 civilians, 1435 militants, 561 security forces personnel and 44 pro-government tribal Razakars were killed in 1578 violent incidents. The pattern of anti-state violence remain almost similar to first eleven months of the year 2012 with a slight decline in overall deaths while escalation in civilian casualties and decrease in militant losses. In first eleven months of the year 2012, the CMC had recorded 1634 incidents of anti-state violence and counter insurgency actions in which 3672 people had died including 1190 civilians, 1828 militants, 527 security forces personnel, and 127 Razakars.